The past weekend set new world record at the online-based auction house Auctionata as they held their 'Important Asian Art' sale. 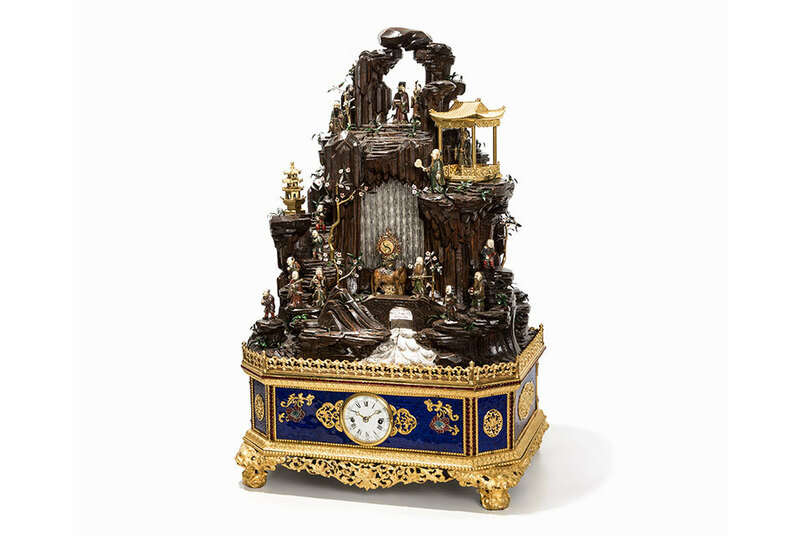 The auction included a rare asian clock which didn't just break a world record for an item sold online but it also set a new price record for Germany in 2015 and in Auctionata's history of online auctions. The object in question is a rare bell from the late 1800s, made in enamel and ivory, representing the magical mountain Penglai where the little figures on the clock represent the Eight Immortals, their attendants as well as the Three Star Deities. The starting price of €300 000 did not deter more than a thousand auction participants from 35 countries that showed interest. After an intense bidding with stakeholders, mainly from Beijing, Shanghai, Hong Kong and New York the bell was finally sold at a price of over €3 370 000, which was not only a new record for online sales but also in Auctionata's history of online auctions. The buyer was Liu Yiqian, a renowned investor and businessman, known for owning, along with his wife, one of the most important collections in China. This purchase is not his only auction acquisitions that has grabbed the media's attention. In April last year he bought the so-called "Chicken cup" at Sotheby's, which was then a new world record for Chinese arts. Check out Auctionata on Barnebys here.